A good grill deserves good tools. 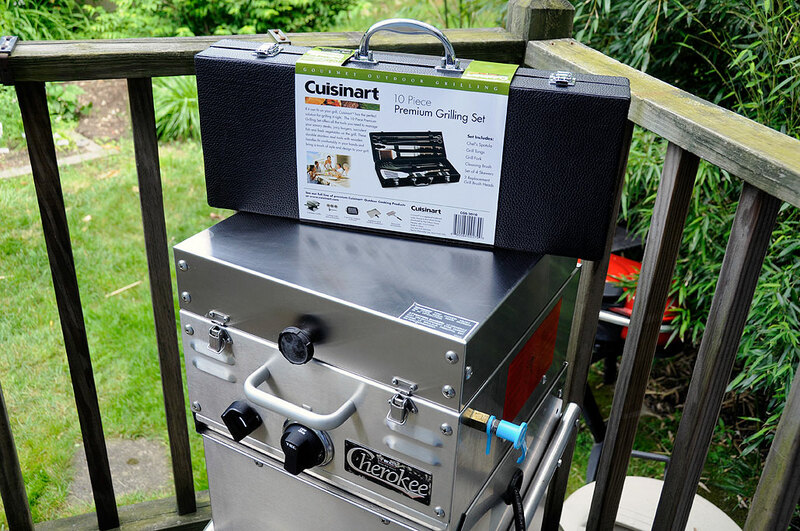 Now that the TEC infrared grill is all cleaned up, we wanted to have some quality grilling tools to use with it. We compared a lot of different sets and finally settled on a stainless steel set from Cuisinart. The place with the best price? Everything Kitchens, of course. We decided on the Cuisinart Grilling Tool Set for four reasons: first, Cuisinart’s reputation; second, their quality—we have reviewed a few Cuisinart appliances (Griddler, Elite food processor, toaster oven) in the past and have found their quality to be excellent; third, the tools are stainless steel—we don’t baby our gear and wanted something that could take a few hits without getting bruised; and fourth, this set comes in a leather case—a nice leather case encourages folks to clean and put things away when done with them. The handles are handcrafted from Pakkawood. Pakkawood is actually a plywood product. Dyes are vacuum-impregnated into the wood, then pressure-impregnated with polymer or phenolic resin and compressed into blocks. This creates a very dense, tough, and solid wood product, that is waterproof and stable. 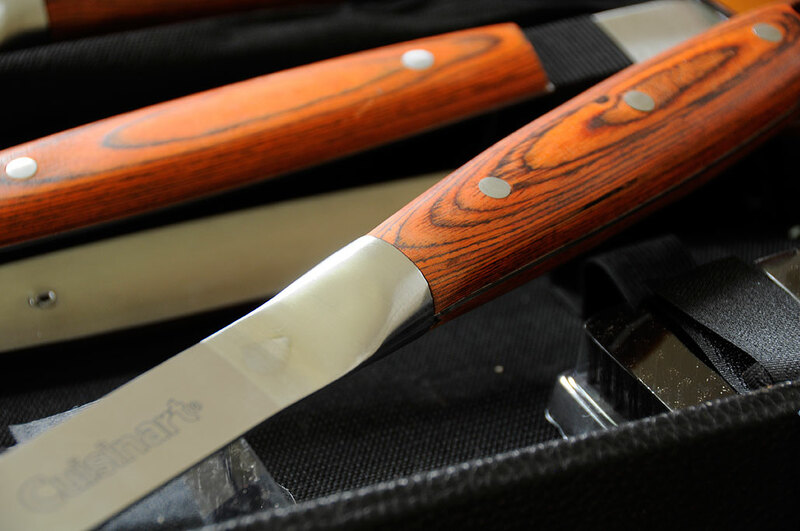 This type of treated wood is a favorite amongst quality knifemakers for both its looks and its performance. The resin-infused wood will retain its shine and outlast most natural hardwoods, especially with heavy use. Another reason why we wanted wooden handles for our grill set is that the heat from the metal parts will not transfer to the wood during use. We should be able to comfortably hold the tools even when working over a very hot grill. The stainless steel is heavy gauge and runs the entire length of the handle. The spatula should be able to flip the heaviest of burgers without bending. The tongs are springy and easy to close, but are stiff enough to grip and hold without twisting. The edges of the tools were all nicely finished with the Cuisinart name deeply laser-etched on the side. A good example of Cuisinart’s attention to detail is the kabob skewers. Note the wooden handle, the “grippy” teeth along the shaft, and the large open-ended ring. The wooden handles make the skewers cool to hold. The directional teeth and beefy skewer secure the food and do not flex even when loaded. The large ring makes it easy to rotate the skewers when on the grill. takes the most abuse and is often the first to go. The one piece which is missing is the marinade brush. We have a few nice silicone ones already so it is not a big deal. Even without the brush, though, this set of grilling tools from Cuisinart is head and shoulders better than many others we have seen. 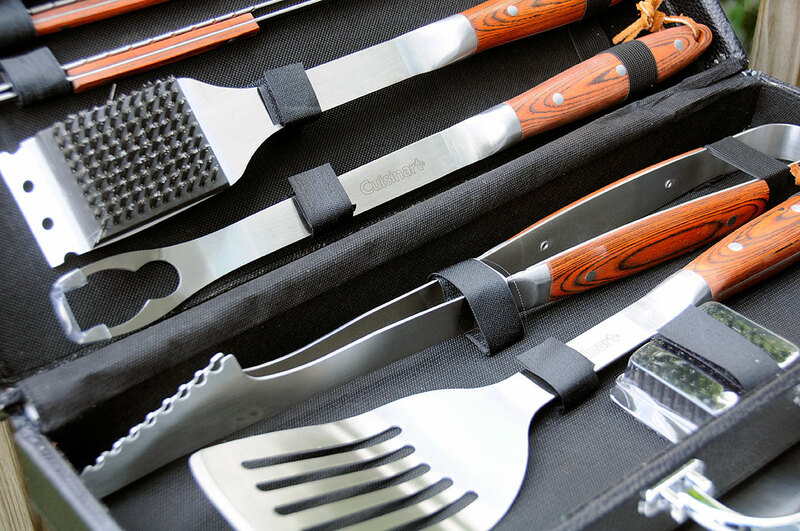 You know, Father’s Day is coming up and this set (CGS-2010) would be a pretty sweet gift for any dad who likes to BBQ. Everything Kitchens does currently have it in stockand will even ship it for FREE. However, don’t wait too long as this is sure to be a popular gift item. We are looking forward to testing out the tools to see if they live up to our expectations. Look for the FirstUse report soon.